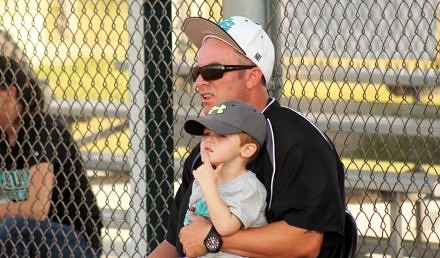 Coral Glades manager Joe Franco with his son, Jackson, and brother, Santaluces manager Nick Franco. 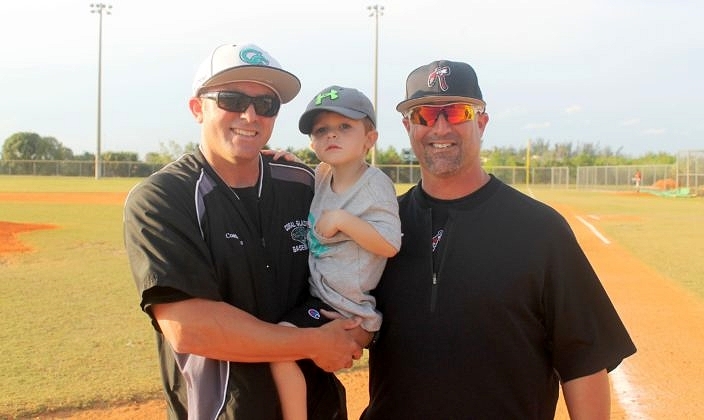 Brothers Joe and Nick Franco are both managers of South Florida baseball programs after also growing up playing high school baseball here themselves. 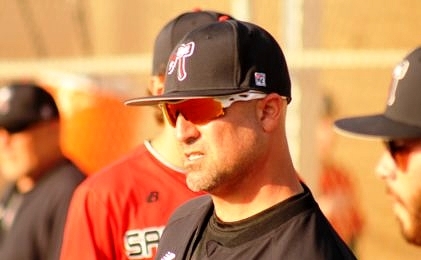 HSBN Editor-in-Chief Rick Duteau sat down with the brothers just prior to their annual game earlier this season, where the talk was on growing up together and how they shaped each other’s lives, what it is like to coach against one another and the time Joe didn’t have a ride and walked home from baseball camp. Enjoy! Rick: OK Guys, I am going to start with the most obvious question. You guys are brothers. Brothers have a sibling rivalry. You guys have had the advantage over most brothers to continue competing into your adult years. So how intense do these annual games between you guys get? Joe: Well, I’m the younger brother, so of course I want to beat my older brother. I enjoy it; it’s one of the games I look forward to most in the year. We’ve always had a pretty good rivalry growing up, so it just makes it a lot more fun knowing that we’re both head coaches for a program and we get to compete once a year. Nick: For me, being the older brother, it has a little bit different meaning to me. Yeah, I sure would like to beat little brother in this match-up every year, and I do think I am 8-3 over these years. But I look at this game just as how proud I am of him. We grew up without a father and I kind of took on that father-figure role, and to see essentially my little son, even though he’s not my son but my little brother, I essentially took on that father-figure role and so I am so proud of what he has done. Not only at Monarch but now here at Coral Glades, he’s been able to be a well-known staple in Broward County. Rick: OK, Joe, now tell me how great it feels to beat your older brother. Joe: It’s a good feeling. I hope he goes undefeated every year, except for one loss against me. But if I have to lose to anybody I don’t mind losing to him, just because of what he’s meant to me growing up. Like he said, he had to be the father-figure and if it wasn’t for him I wouldn’t be here. If he was a bad kid growing up I would have been a bad kid. Since he was a good kid and a good baseball player, I was a good kid and a good baseball player. I look up to him a lot and I pretty much owe him everything, other than my mom. It’s definitely good moments that we have out on the baseball field. We’ve only played in one game together, and it was a men’s league that we played one inning together. So the fact that we get to share the field as coaches makes it that much more special. Nick: Yeah, and it’s been a lot of fun playing each other. We’ve played every year but one, because of rain, and we made up for it with a doubleheader the following year. Unfortunately we only played one men’s league together. We did face each other once; he’s a pitcher and I was a hitter. He struck me out, so I will tip my cap to him. All I can think about was I was trying to take him yard and I pulled my head and struck out swinging. Joe: And then he wouldn’t give me a ride home after the camp was over. Nick: That is a true story. I did not take him home. Rick: Ha ha ha! Now how far did he make you walk? Nick: No way! Two miles! Joe: OK, it was really about four miles. I had to walk about four miles home that day. Rick: I guess you guys do not carpool here. You’ve beaten him three times in this series, so was that three times you had to walk home and eight times you got a ride home from him, Joe? Joe: I will always have the win in the first-ever game we played. So I’ll cherish that. Nick: My shortstop was absent that game, buddy. Rick: So these games have meant more the past couple years, as Joe, your young son, Jackson, has become part of the games. Nick, talk a little bit about how great it is for the Franco family to have someone to pass the torch to when you guys call it quits. 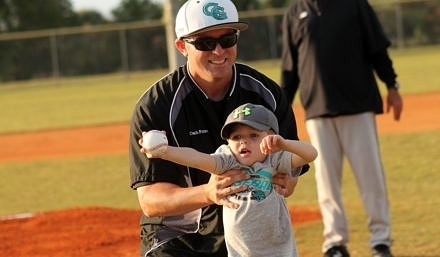 Nick: It’s unbelievable to see how much Jackson loves, not only baseball, but his father. The kid lives and breathes baseball and whenever I am around him in family time all he wants to do is hit or throw. It’s really awesome to see. My wife and I have chosen not to have children, so what better way than to just be a proud uncle with little Jackson. He is a staple at the field, the kids all love him and he loves the kids. I can’t wait until he sees Uncle Nicky beat Joe today. Rick: Joe, younger brothers will never admit this publicly, but there are things they admire and look up to in their older brothers. Give me something, an example, or a habit, that you have always looked up to in Nick. Joe: One of the things I liked about him growing up was that he is a committed person. He was dedicated to what he wanted to be successful at, and I kind of saw that growing up. Whether it was school, and he had a good GPA in high school and in college, he had goals and he achieved those goals. Those are some of the attributes that I took from him: being disciplined, being a good person and hanging around the right people were some of the things that I saw him do. I wanted to follow, and, like I said, I owe him and my mom pretty much everything for the way I am as a person. Rick: Really, as you mentioned earlier, Nick, there are always a bit of those proud papa moments when dealing with a younger brother, especially for you. What are you most proud of with Joe. Nick: I kind of want to piggyback and what he said, but just reversed. I’m awfully proud that I was able to grow up and instill in him a good work ethic and to be a good person, because I felt like I, with that extra burden of being a father-figure role that I had to take on after our father passed away, that I made the right decisions and that I chose the right path that was going to be successful for me. It was really rewarding to see how he looked up to that and followed that, instead of being the exact opposite and doing the exact opposite. But yeah, it’s been great. Joe: Don’t kid yourselves; we had many fights and many times were there were battles, just like any brothers do, but there is no one that I look up to more than him. Nick: When I made varsity as a sophmore over at Coral Springs, he said, ‘I’m going to make varsity as a freshman at Coral Springs.’ Sure as anything, he made varsity as a freshman. I’ve always been kind of proud that he’s always had the mentality that I’m going to one-up you, because that’s made him successful. He went to Palm Beach State just like I went to Palm Beach State, and he went on to Nova Southeastern University after Palm Beach State. He was a pitcher that didn’t overpower people but he knew how to pitch and he got people out. You had the single-season save record for a while there. Joe: Yeah, it just got broken recently. Nick: I think that his success on the field was a direct contribution to me leading the right path for him, and being somebody that he could look up to. 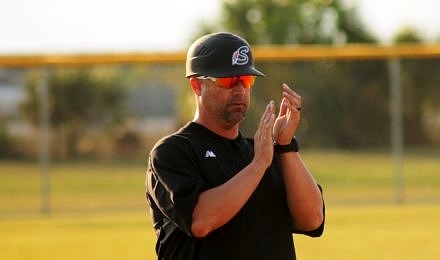 Rick: You both played the game at a high level, and have deep roots here in Coral Springs. A couple of years ago, the Coral Springs job came open. Did either of you wonder what it would have been like to take over at your Alma Mater? Nick, we can start with you. Nick: I never considered it, because I’m a Palm Beach boy now. I migrated north and I am very happy in Palm Beach County and at Santaluces. So it never crossed my mind. We had discussions when it became available about Joe possibly putting his hat in the ring. Joe: I remember talking to Coach Bumbales when I was in high school saying, ‘I am going to run this program one day’, and Frank Bumbales is another guy that I look up to and that taught me a lot in my four years of high school playing for him, and we still talk to this day. You know, I remember when he said, ‘One day when I retire maybe this can be yours’, so I gave it a lot of consideration. I just wasn;t ready to leave what I was doing at Monarch. I was proud of what I accomplished for the ten years that I was there, and then when Coral Glades offered me the job I said there has to be a reason, and I am very happy at Coral Glades. The administration is great, the school’s great and the kids are great here. Nick: I also want to add that I chose a lot of what I chose to do because of Frank Bumbales. Just like Joe, I still have the relationship to this day. He was a major father-figure influence on me. That was my chance to actually look up to a male role model. Rick: Here, you also didn’t have a father, while growing up and having to be a father-figure for somebody else. Nick: Right. So Frank was kind of that person for me, that really struck home and really mentored me into choosing the path that I chose. 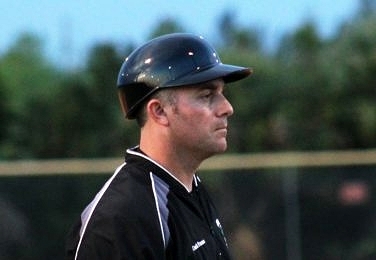 I always said I wanted to be just like you, Coach, a PE teacher and a baseball coach, and that’s exactly what happened. Joe: I’m about the same thing. Freshman year in high school I wanted to do what Frank Bumbales is doing, and I’m doing it, other than I teach World History. Joe: I think our boxing matches were pretty competitive. We used to box all the time, and there were certain rules if I got him on the ground I could still hit him and if he got me on the ground he couldn’t hit me anymore. Nick: Whiffleball. We had battles in that. Joe: Up north in Plymouth and Boston and growing up there the whole summer, so my mom could get a little bit of a break we were staying with our dad’s side of the family, and whiffleball was important to us. Joe: He wouldn’t let me play video games when his friends were over. Nick: When my friends were over, no Joe. But when we did have some alone time we did have some Nintendo battles. It was fun. It was a good childhood. Rick: Any particular Nintendo game? Nick: The Little League World Series game. Joe: Yes, the Little League World Series game. I still have that, actually. Rick: Nick, usually the older brother is the mentor. But is there anything you have learned from Joe through the years? Nick: He’s so similar to me, but the one thing that makes me so proud is seeing him as a father, and how amazing of a job he is doing as a dad. How much Jackson loves his father is just amazing to see and it gives me goosebumps thinking how that is my little brother that now has a kid. I still have the mentality of a high school student, so I don’t think anything with having a kid. Rick: You see, I can relate to you. I am one of seven kids in my family, and I’m probably not going to have any kids. So I get to be the uncle and be proud of them. Nick: I love being the uncle, because I can also just pass Jackson back to Dad. But seeing how Jackson just truly loves his dad is just amazing. Rick: As you get older, have you guys ever thought about coaching together at some point? Joe: That’s a great question. I would like to coach my son in high school, so when my son graduates maybe that would be something down the road. I’ve thought about it a couple of times, but I don’t know if we could coach on the same staff. I have my ways of doing things and he has his ways of doing things, and some are similar, but some are way different. You’ll see tonight; I’m very animated and enthusiastic and he’s very calm. Rick: Yeah, I have seen you both coach before and you’re right. Joe: He’s got his coaching style and I have my own coaching style. Nick: Our philosophies on baseball are very similar. Our means of getting our philosophies across are quite different. But, we’ve never really had the opportunity to think about it. Rick: Yeah, you both have your own programs. Rick: I guess Joe will have to come north then. Joe: Maybe when Jackson is on a T-Ball team he can coach a few Saturdays. He starts T-Ball in September. 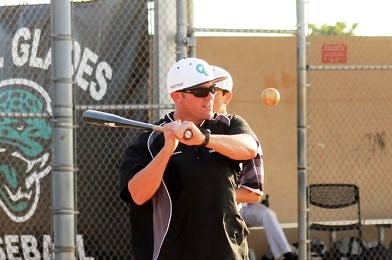 Nick: I think I’d rather coach Jackson then actually be in the same dugout coaching together. Rick: OK, we are going to finish with this, and each of you can give an answer to all of these. Nick, you can go first to each, and Joe you can answer next. Nick, who has the worst temper on the field? Rick: Who’s the most organized? Rick: More aggressive situational coach during the game? Rick: A district title for my team, or a state title for my brother’s team? Nick:A state title for my brother’s team, because we can still win a state title without winning districts. Rick: The best quality of my brother as a coach? Nick: How much he gives to the kids of Coral Glades and, previously, Monarch. Rick: Game’s on the line. What am I using, that I know about my brother, that will help me win the game? Nick: That’s a good one. I think I know his signs; they might be the same as our junior college’s signs. I probably would just make fun of something he was doing and he would get flustered and he wouldn’t remember what he was doing. Rick: Mental intimidation; I like it. OK, your turn, Joe. Who has the worst temper on the field? Joe: I would have to say Nick. Joe: A state title for my brother’s team. Joe: His dedication to the kids and his school. Rick: Game’s on the line. What am I using, that I know about my brother, that will help me win the game tonight? Joe: That’s a tough one. I’m going to have to say the safety-squeeze. Rick: Maybe just try and block him out when he tries to get in your head. Well, guys, I really enjoyed that and we all really appreciate it. Enjoy the game tonight!